Do people who work in bookstores just have a way with people, or is it their love for books that shines through when they talk to their customers? Hamlin and I visited the charming waterfront town of Cobourg, Ontario recently, and dropped into the Avid Reader bookstore on Division Street as you enter the town off the highway. We were greeted by Julie and Kelly, two knowledgeable and friendly staff members who immediately welcomed us warmly. Since my book A Good Home is now being sold in the store, and the magazine I write for (Arabella Magazine) is also carried by Avid Reader, it was great to visit the store and meet the staff. 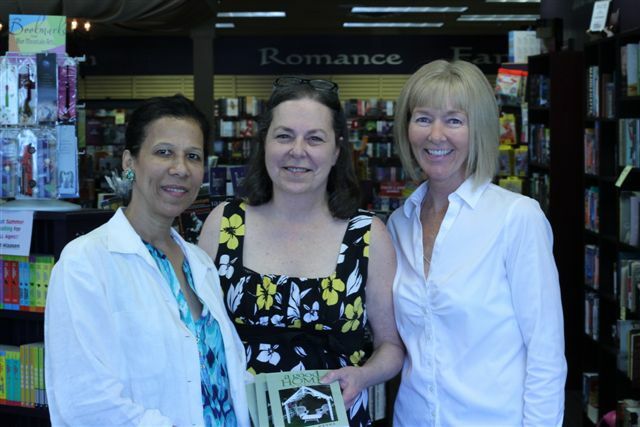 Visiting Julie Maynard and Kelly Lenahan at Avid Reader Bookstore. Avid Reader sells a wide selection of books and magazines. Like many bookstores these days, the store has also added a range of gifts to its stock. But there’s no question: books and magazines are their main stock in trade. In fact, they have the largest selection of magazines I have ever seen in a bookstore. These people love books and magazines, and love to answer their customers’ questions about them. The Cobourg area is one of the places my family called home in earlier years. We have watched this historic resort town develop, while maintaining the old world charm and great beachfront that have drawn summer visitors and home-buyers to the area for decades. Today, Cobourg boasts a fabulous promenade, as well as pergolas and gardens along the waterfront, and the town has managed to preserve its history even while adding new housing developments and interesting places to dine, be entertained, and shop. One of those interesting places to shop is The Avid Reader. Drop in sometime and say hello to the helpful people there!